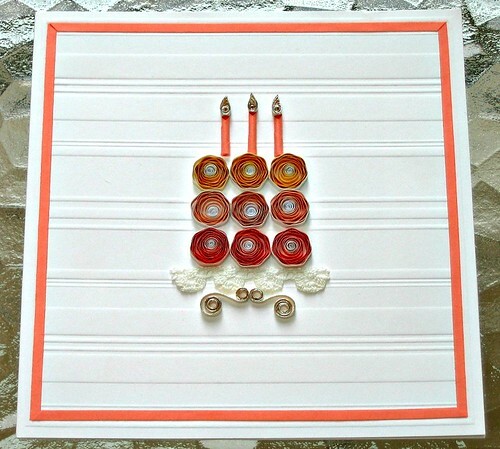 Here's an idea for a dimensional birthday card... a quilled cake with candles. Cake: Run a stack of three quilling strips through the crimper. Repeat for a total of 9 strips. 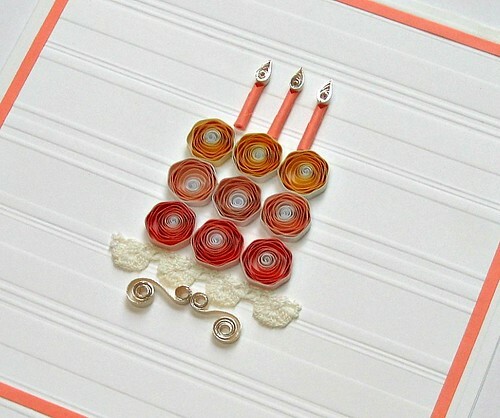 Gently roll each strip on a quilling tool, allow the loose coil to relax, and glue end. Make each coil about the same size. Arrange and glue as shown onto the card. Cake plate: Glue a small strip of lace below the cake and under that, glue two silver-edge asymmetric S scrolls placed horizontally. To make each scroll: Roll one end of a 4-inch strip past the center point, then roll opposite end toward first roll. Candle flames: Roll three silver-edge curved teardrops. To make each curved teardrop: Roll a 4-inch loose coil. Pinch to a point, then curve tip slightly with fingers. You'll find previous tutorials for making candles (or quilled spills, as they are officially called) and for mitering border corners here and here. A funny story about this card... last week it won the Craftsy Birthday Card Contest which was a big surprise to me. I had stumbled upon a post about the contest just a couple of hours before it was scheduled to end. Immediately this card sprang to mind... I'd made it to have ready for my niece's third birthday. Kismet - it was also Craftsy's third birthday! Believe me, things don't usually go that smoothly, but it's sure nice when they do. 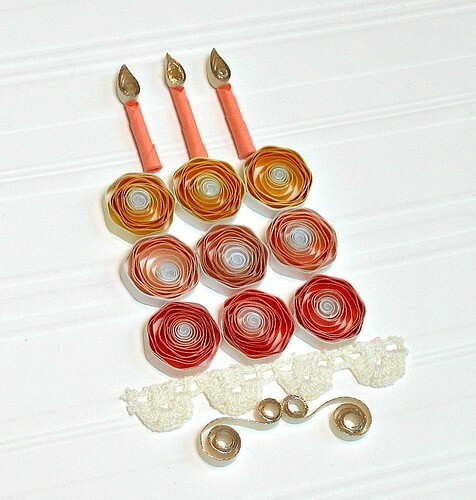 If you're new to quilling, I've posted lots of tutorials and answered FAQ. Lovely card Ann! Great use of the Paplin graduated papers. Such a cute card. It deserves to win the contest.